Pre-requisites: None. Beginners - pros are welcome. $75/person. All prices are US dollars. 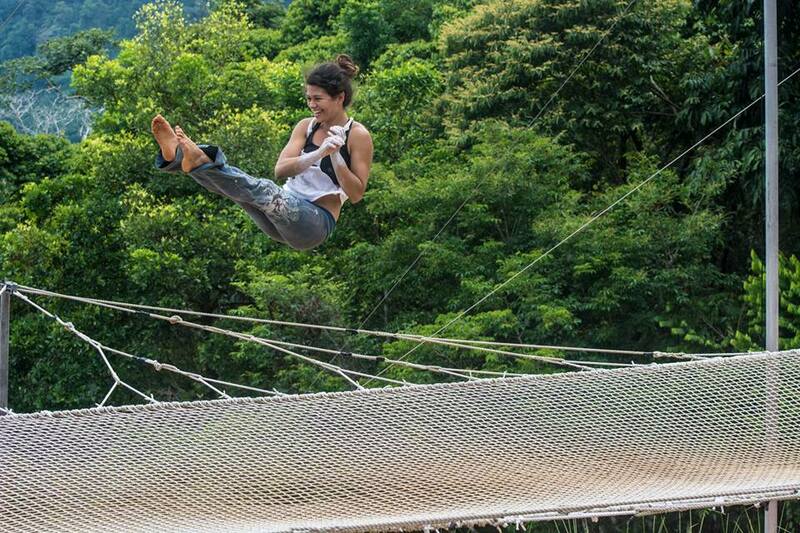 Our coaches are trained and overseen by Jonathon Conant, founder of Trapeze School New York. TSNY is the industry's pioneer and international leader in the field. Whether you're a beginner or a pro, expand your aerial silks skills repertoire and enhance your creativity and performance in these special 1-hour master classes with Christine Van Loo. 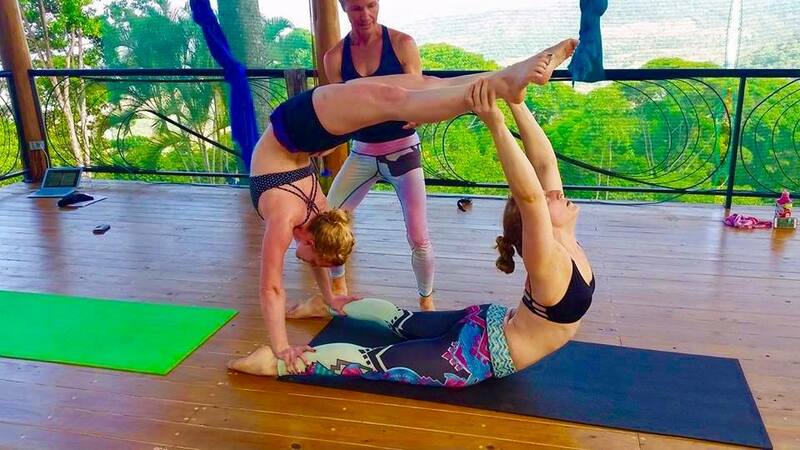 ﻿﻿Enjoy private and group classes with a professional aerialist in our Temple of Light, an open-air pavilion with 20-25 foot high ceilings, fresh breezes and awe-inspiring views. New aerial silks skills and sequences. How to make your transitions invisible, incorporate creative choreographic innovation, self-expression, musicality, transitions, performance techniques and artistry that will invigorate your routines with life, refinement and excitement. Ways to incorporate the silks as a tool to increase your flexibility and strength. What to bring: Bring a water bottle and a snack. There is a small break in the day but no “lunch” time allotted for the seminar. Bring a pen and paper or a notebook. Feel free to take pictures. You'll love our breathtaking facility. $160/per person - 6 person minimum to 16 person maximum at Airborne Arts. Note: 4-hour seminars are recommended but 3-hour seminars are available at $120 per person. 6 person minimum. Christine Van Loo was a trainer and performer on NBC’s Celebrity Circus. 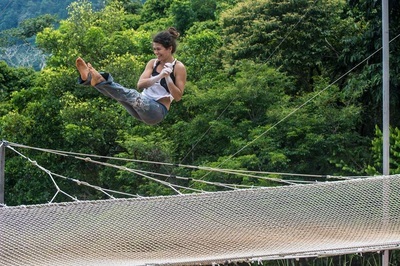 As a professional aerialist and acrobat she has performed in the 2002 Winter Olympics, at two Grammy Awards (with No Doubt and with Ricky Martin), at the American Music Awards (with Aerosmith), the Miss Universe pageant, and Paul McCartney's European tour, as well as several feature films, television shows and music videos. She choreographed the aerials for Britney Spears World Tour and the Stars on Ice US tour. Currently she is touring with Cirque de la Symphonie when not at home at Airborne Arts. For aerial silks 1 hour classes there are no pre-requisites. Beginners -pros are welcome. ​For the 4-hour group session, we recommend that you be able to climb and invert (go upside down from a free grip) on the fabric. It's important to cover your midriff area and your legs to avoid skin abrasions. The best way to do this is to wear a unitard or leotard with leggings, tights, or form fitting work out pants that end at your ankles. Guys are welcome to do the same along with a dance belt. Or if you wear a shirt and gym pants alone make sure that the shirt is long enough to tuck in securely, and know that it can come untucked and that you can get a fabric burn. Another way to securely cover your waist if you want to wear a shirt and leggings alone is to buy a body shaper like a waist corset (Spanx). You can find them in the women’s lingerie section at Target or Macy’s. A shirt that covers your underarms is also recommended. Bare feet. Remove all jewelry. No moisturizer. Have a great time learning the fundamentals in acrobatic Balancing. We'll partner you up so that you learn lifts, balances, counterbalances, coordination, concentration teamwork & holding handstands. We can partner you up in class. This powerful 4-hour seminar challenges your body, inspires your mind and invigorates your spirit. You’ll hardly realize that you’re working out you’ll be having so much fun. Improve your acrobatics game, create a larger vision of who you are and of what you are capable of achieving. Learn strategies to achieve your ideal life faster. Pre-requisites: Only minimal athleticism is recommended. Beginners are welcome. Solo and partnering PNF stretching techniques to increase your flexibility. Correct body alignment, entry and bailing techniques, balancing strategies and tools to take your handstand practice to a higher level. Partnering lifts, balance and counterbalance skills. Group participation activities to build trust and intuition. Enjoy a motivational speech from Christine titled: “How to Create a Larger Vision of Yourself” that teaches champion strategies to supercharge your ideal life. Exercise clothes that you can move in. Shorts and fitting exercise shirts are best. Barefoot. Hair tied back. No jewelry. Bring a water bottle. We had a great time here and definitely plan to return. Very professional. Very effective coaching. 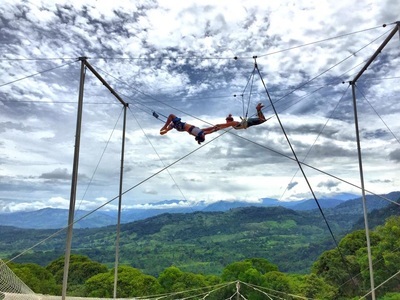 As an athlete and coach myself, I appreciated the challenge that the trapeze presented, combined with the knowledgeable staff for an activity that many people would think out of their reach and comfort zone. This is not so... Don't be intimidated. Give this a try!!!! Amazing experience overall! Great Fun and Great instructors, very friendly and will have you trapezing in style no matter what you abilities are. A real adrenaline rush, highly recommended! Spectacular location, exhilarating experience, expert/safe instruction! This is an opportunity of a lifetime! 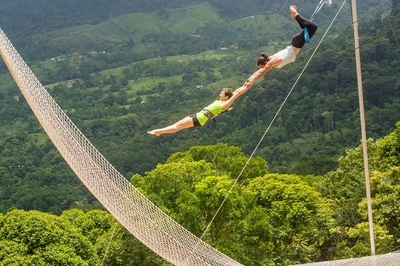 Trapeze was sort of childhood dream of mine, but I never envisioned it in such a beautiful place and with such great people. It really does NOT require special level of strength or special skills. I plan to do more!